Thank you for all the nice comments. I read every comment and am aided by your positive feeback. 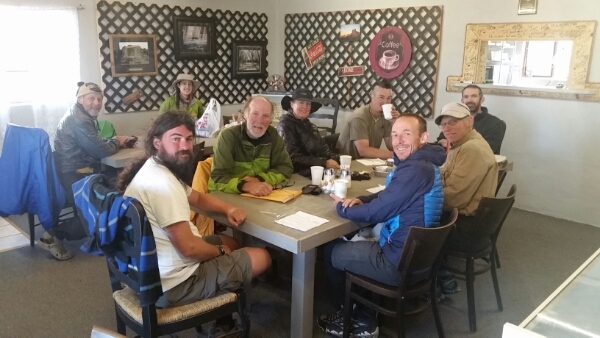 I am having breakfast at the Gathering Place with about 10 other CDT hikers before I head back to the trail this morning. Even more showed up after I took the photo. The community of CDT hikers is another positive aspect of this journey. They represent young and older (like me! ), U.S., Spain, France, Belgium, Germany, Australia, Korea, and more places. This entry was posted in CDT New Mexico, Continental Divide Trail 2016, Section 2: May 1-15. Bookmark the permalink. I am really enjoying reading your updates – the descriptions of the land and people are wonderful and the pics add a wonderful dimension. What a wonderful adventure you are having – thank you for sharing! Wishing you good weather, happy feet and great experiences along the way. Having so much fun following your blog. Yay for Roger! I love reading your updates and seeing your pics, especially the rattlesnakes What an inspirational adventure! CDT: Home for two months! Just saying thanks! CDT Sept 28 – Oct 3: East Glacier to Canada! Greg In Wild on CDT: Home for two months! Just saying thanks! Sallie on CDT: Home for two months! Just saying thanks! John McDonald on CDT: Home for two months! Just saying thanks! Marv on CDT: Home for two months! Just saying thanks! Tony Wilson on CDT: Home for two months! Just saying thanks!